OWCA Cluster common areas are maintained by Blade Runners. Blade Runners visits weekly to mow common areas, remove leaves and grass clippings. 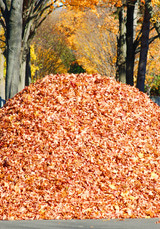 In the fall, the company provides neighborhood wide leaf removal on two separate dates, which are scheduled once the majority of the leaves have fallen. Blade Runners also does occasional special landscape improvement projects as contracted by OWCA. Details about what is collected are below. Trash is picked up twice weekly on Monday and Thursday. To discourage wild animals (yes, we do have them) from visiting our yards and common areas, residents are urged to put trash out for collection in closed receptacles. Household Power Tools - CSI will pick up most household electric and gasoline power tools, such as lawn mowers, edge trimmers, chain saws and power washers. Note that gasoline-powered tools must be completely drained of fuel and oil to be accepted for collection. CRT-equipped TV Sets - CSI has informed the cluster that they will pick up CRT-equipped TV sets of any reasonable size. Call CSI at 703.444.3181 if you have an especially large TV, such as a console model in a cabinet to be sure that they will pick it up. Plastics: Below is a basic list of the types of recyclable plastics and examples of their common uses. PET: bottles for soft drinks, water, juice, mouthwash, salad dressing. Food jars. Microwaveable food containers. HDPE: Bottles for milk, water, juice, cosmetics, shampoo, household cleaners. LDPE: Bags for dry cleaning, newspapers, bread, fresh produce. Shrink wrap and squeezable bottles. PP: Containers for yogurt, margarine, and takeout meals. Medicine bottles. PS: Plastic food service items such as plates, cups, cutlery, meat and poultry trays. Protective foam packaging for furniture and electronics. Packaging peanuts. Other: Three- and five-gallon reusable water bottles, some citrus juice containers and catsup bottles. Yard debris is picked up on Wednesdays, along with household recycling. Yard debris includes leaves, weeds, prunings, grass clippings, brush and woody material up to four inches in diameter and four feet in length. Yard debris does not include food or vegetable wastes, household or hazardous wastes, animal waste, plastic or plastic bags, construction debris, dirt, sod, rocks, branches over four inches in diameter or four feet in length, or stumps. Please tie branches into reasonably sized bundles. Other material may be put in plastic or paper bags made for the purpose.